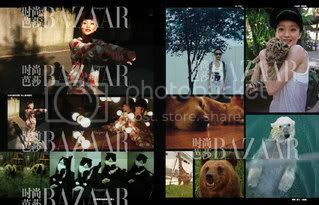 On November 10th, on the occasion of 140th anniversary, the fashion magazine Bazaar will have a special edition in which there is a collection of 140 Zhou Xun's photos in about 30 pages. This is the first time an artist appears in such many pages in a magazine. 140 photos were taken in one year by Zhou Xun and staffs of the magazine, record Xun's images in work and daily life, true and simple Xun, not a movie queen. It is Dai Qi, Xun's boyfriend, has the majority of ideas of these photos. This album is considered as Xun's documentary with real content and extemporaneous creation. She herself writes comments for photos, some of them are funny and another ones are are moved. "This is like a story, a film in which I am the leading role, can be called"Life" Xun said.